To live a life of difference you have to follow the path less taken. What makes people not so much different from one another is that they follow similar paths. All lawyers are perceived as argumentative and not different from one another because of the path their profession takes them through. Politicians are seen as never straight dealing and constantly making promises they won't fulfill. Doctors are believed to take things too seriously. Engineers are seen as arrogant, thinking too highly of themselves. Bankers are expected to be greedy. Accountants are seen as stingy. The paths we take not only decide who we become but the perception people have about us. 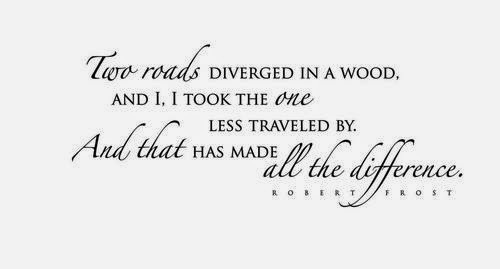 Have you considered taking an uncommon path? Going against the crowd. Following the path less taken. In your career. In your interests. In your vocation. And in your plan for the future. Have you considered filling your life with more adventures. Facing your fears. Paddling a canoe. Spending your vacation at the Devil's pool in Zambia. You can decide to be a specialist in an area of your professional field that only a few people know about. You can decide to make a serious hobby out of that interest of yours people consider too childish. You can decide to start keeping a daily journal and have something to fondly look back on when you're old and even share with your grand kids. You can start trying the very activity that scares you most. Start facing your fears. It's uncommon, most of us ignore out fears. Spend your vacation in unusual ways. Add color to your life. Always smile on the phone. It's also uncommon. Be nice to the people you care very little about: the gateman, the traffic warden, the cashier, the cleaner, a policeman and the market woman. Follow your good passions. Let go of what people will think or approve of. Go after the life of your dreams. Have original dreams. Let you passion drive you and not what other people do. Don't let all your decisions be built on ask the audience. Don't let your life be directed by the results of a public poll. Don't follow the popular path always. Live a life of difference. And following the path less taken makes all the difference.